I am currently reading Earthbound by Aprilynne Pike and so far so good. 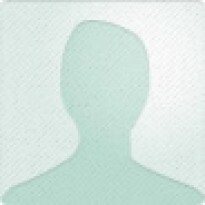 Tavia the main character, finally knows who her strange stalker is, Quincy Adams. He is still a mystery to her but she has a liking for him. When she plans on telling Bensen. strange things begin to happen. Her chapstick keeps disappearing and reappearing right in front of her. Tavia starts to freak out and Bensen calms her down by kissing her. He then tells her how he feels and she has felt the same way ever since they first met. Now what is she going to do about Quincy? 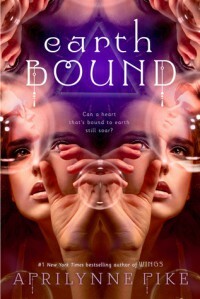 I have changed book and now started Earth Bound by Aprilynne Pike. It is a story of a sole survivor of a plane crash. She has lost her parents and now is starting to see ghosts. She has no idea what is happening to her. Right now where I am in the book, She had to relocate so media wouldnt find her. She is adopted by her aunt and uncle who she had never met before and is starting to see ghost. Is she going crazy? Im close to the end of the book now and I am in tears when Adam come in. He begs Mia not to leave. He plays her one of her favorite pieces of orchestra. He starts to cry explaining to Mia, hoping she could hear him, why he needs her to stay. She once again wants to stay and the book ends with her opening her eyes and seeing Adam. I am looking forward to reading the next book to see what happens. Mia is barely moving around in her ghostly body now. Her grandma is just as demanding as usual but her grandpa surprises her. After getting close to him on there previous trip to Julliard for an audition, which is a whole other side story in the book, they became closer. Her grandpa leans closer to her, in tears, and says " you can leave if you want" she very much appreciates this because everyone has asked her to fight or stay and shes too tired for that. It makes her happy to see her grandpa understanding her situation. Mia survives surgery and Adam finally gets to see her. Mia can tell hed been crying and it kills her. She loves him so much. After awhile people come through and see her. All had been crying. When her best friend Kim comes in and assures her that she still has family and not to leave. Mia wants to come out of coma and talk to her so bad but she cant. Mia is exhausted and hardly moving out in her ghostly body now. Adam finds out about Mia and is going to see her. Mia finds out her brother Teddy didnt make it and wants to die also but she doesnt understand what her out of body expierience works. can she just leave? She wants to stay because of Adam but wants to leave because her parents and brother has died now. She is split on her decision and is also having another surgery for a bleed somewhere. What will happen next? The book is amazing so far I love the side stories in between. It gives me a better idea of Mias previous life. Her family and friends. I really enjoy this book so far! 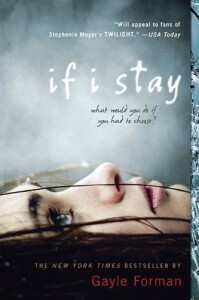 I have recently changed book and am now reading if i stay by Gayle Forman. I first heard of the book from my little sister. I am really into it so far and highly recommend it. The main character is Mia. Everything is perfect for her until her and her family got into a car accident and she lost her parents. Her brothers fine but she is not doing very well. She is having an out of body expirience, watching the doctors try to recover her body and keep her alive. I am at that so far and am really excited to continue to read the book. I am really enjoying the book Proxy. The action and suspense is keeping me glued to the book. Syd is being punished for Knox's wrong doings. After finding out he is being punished for a death this time, Syd decides to try and escape. He pretends to need assistance then reprograms the robot assisting him. He gets away from the guardians and out of the facility. His only way to go now is where there is said to be no civilization left alive. The book is so far awesome! So far while reading Proxy I am enjoying it very much. The newly introduced character is Syds boss Mr. Baram. I have also found out that Syd is considered a chapter 11 or homo. Syds bestfriend wants to go to a patrons party, the only problem is proxy's are not allowed. I am anxious to read what happens at the party. So far in the book Proxy, the introduced characters are Knox, Syd, and "Tom Sawyer". "Tom Sawyer" is an orphan and a refugee. The system is renames orphans from a database, which pretty much makes a new person. Unfortunately doing all that puts the orphan in debt, 18 years of debt. Civilization isn't free in this book, when you owe debt you are a proxy. A Proxy to the patrons, a Patron owned the debt and proxies took their punishments. Syd has the worst patron of them all, which happens to be Knox. Syd is now about to be punished and he doesn't know why yet. So far I am really enjoying Proxy and look forward to finishing it. 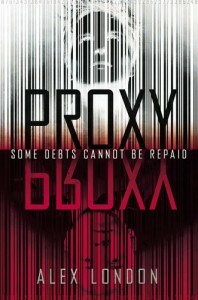 Proxy is a book into the future. People are genetically engineered to look a certain way and are born into different classes according to wealth. Knox and Syd are the main characters or "character" in the book. Syd's life is not his own, he is Knox's proxy. In other words he receives the punishment for Knox's wrong doings. So far the book is very interesting and I am excited to read more.